The artist behind some of Jalisco’s most iconic sculptures will be the guest of honor at the American School of Guadalajara’s 25th annual Art Fest next weekend. 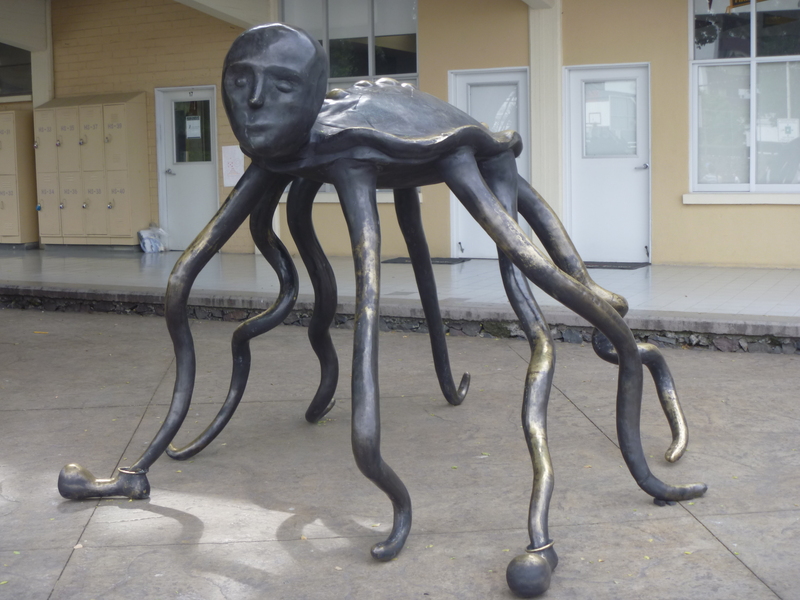 Guadalajara native Alejandro Colunga, the creator of the surrealist bronze chairs found in front of the city’s Hospicio Cabañas and on Puerto Vallarta’s Malecon, will be painting with students and performing live music with legendary Tapatio rock band The Spiders at the prestigious American School on Saturday, November 9. The school will also be hosting an auction at the Club de Industriales the previous night, where original works by local and international artists – including two iconic pieces by Andy Warhol – will go on sale. The aim of the festival is to showcase local talent, but above all, to have a good time. “It’s an opportunity to enjoy ourselves,” Colunga, 64, said at a press conference at the American School on Wednesday. “Young people are the essence of this festival. It’s not just for the children from this school, but for all of the community,” he added, noting that the event is free to the public. “I’m really moved by the way the children and young people have responded in the different areas of the arts,” Colunga said, having observed and interacted with the school’s pupils during their art classes. “You can learn a lot from children. They don’t paint or make music with the pretense of selling it. They have such a fun, fresh and spontaneous way of doing it. “We need them more than we need assassins,” Colunga added, in reference to Mexico’s problems with drug-related violence. “We’re talking about a tough, frightening, brutal reality. It seems like the human race is going backwards,” he said, before taking a pop at the politicians he feels are responsible for many of the nation’s problems. Forty professional artists will then be exhibiting their work at the school the following day, along with a number of talented young painters from first grade through to twelfth. Colunga has produced a special artwork in honor of the festival and his surreal “Tortupulpo” sculpture has been temporarily relocated to the school, affording pupils the opportunity to not only view the metallic tortoise/octopus hybrid from up close, but also touch and even climb upon it. “Music is my passion. I’m in love with rock and classic blues,” Colunga said. “When I was a young boy I was sure I was going to be a rock guitarist.” Although he was beginning to achieve success in the heady days of the 1960s, Colunga abandoned his dream after tragedy struck and three of his close friends died from drug overdoses. “I stopped playing because I was scared that I would end up like them, as I was also a real addict,” he admitted. Despite since finding fame as an artist, Colunga never lost his passion for music. He continues to collect guitars and would often play alone at home until his friend Tony Vierling, the Mexican-American singer and guitarist of The Spiders, persuaded him to play in public again. Their joint performance should not be missed. The American School auction takes place at the Club de Industriales (Francisco Javier Gamboa 2, Colonia Ladron de Guevara) on Friday, November 8, from 7 p.m. until midnight. The Festival de Arte follows at the school grounds (Colomos 2100, Italia Providencia) on Saturday, November 9, from 11 a.m. until 9 p.m. Entry is free to both events.